One of the most popular techniques for reducing excess hair on the face and body is advanced Laser Hair Removal. This procedure safely treats women and men of all skin tones and hair types, and is quick, painless and highly effective. 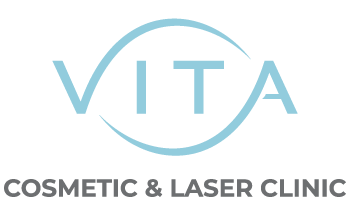 At Vita Cosmetic and Laser Clinic, we use only the most advanced medical-grade lasers for safe and effective results. Our laser hair removal specialists have many years of experience, which for you, means successful hair reduction for any skin and hair type. The process begins with an initial consultation with one of our Medical Practitioners to discuss the area of treatment and how best to prepare. During this consultation, we will also do a patch test on the area you have selected for treatment. On the day of your first treatment, we will cleanse the area to be treated. Then, the handpiece of the laser will be applied to the skin by gliding it smoothly across the surface. Some clients have reported a slight tingling sensation treatment. A soothing aloe gel is applied is applied at the end of the treatment to maximize comfort. Typically, you can have your next treatment within four to six weeks. Laser hair removal is an excellent treatment for targeting unwanted body hair. Our lasers can be used safely and effectively on any area of the face and body, including underarms, chest, back, legs, and even sensitive areas like the bikini line and upper lip. Our staff members are highly trained and specialize in treating women and men of all skin tones and hair types. With minimal downtime and highly effective results, you could have long-term hair reduction in just a few sessions. The Icon™ laser system provides permanent and effective hair reduction treatment. Just a few simple treatments are all it takes to minimize hair growth for good. Unlike shaving that lasts only days, waxing that needs to be repeated every few weeks, or tedious and painful electrolysis, laser permanent hair reduction is a lasting solution that eliminates the everyday hassle of dealing with unwanted facial and body hair. Icon™ light-based technology works by targeting and destroying the hair cells responsible for hair growth without harming the surrounding skin. This approach is, quick and simple, with each treatment complete in just minutes. The technology is FDA-approved and works on a variety of skin types. Using the Cynosure system of proprietary technology, the Skintel™ Melanin Reader offers aesthetic practitioners an accurate assessment of skin type and treatment parameters. The Skintel™ Melanin Reader quantitatively determines the average melanin density of the skin prior to an energy-based aesthetic treatment. Understanding how much melanin is in the skin helps the practitioner to best choose the treatment settings on our laser systems for enhanced outcomes, while minimizing the risk of over-treatment.